This collection of newly commissioned critical essays reads across and between New Yorker departments, from sports writing to short stories, cartoons to reporters at large, poetry to annals of business. Attending to the relations between these kinds of writing and the magazines visual and material constituents, the collection examines the distinctive ways in which imaginative writing has inhabited the prime real estate of this enormously influential periodical. 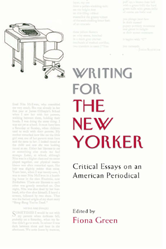 In bringing together a range of sharply angled analyses of particular authors, styles, columns, and pages, this book offers multiple perspectives on American writing and periodical culture at specific moments in twentieth-century history.